Wacom Intuos Pro brings new control to your creativity. 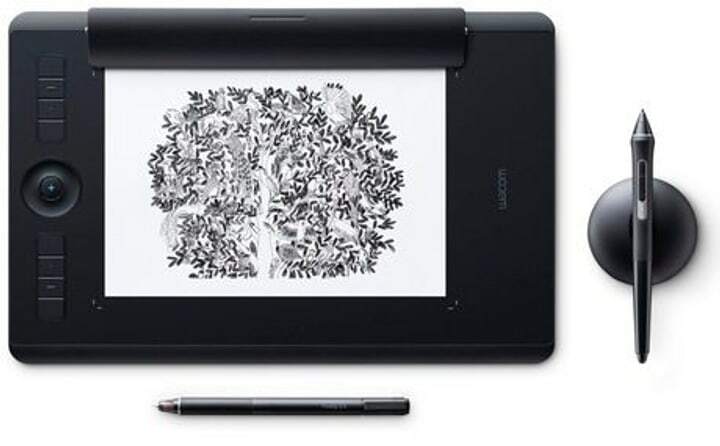 The sensitive Wacom Pro Pen 2 and slim tablet design enable you to draw in unprecedented detail. And working with Wacom Intuos Pro Paper Edition, you can draw in ink on your preferred paper with the Finetip Pen and convert your sketches into digital files – ready to edit in your favorite software. Wacom Intuos Pro comes in both Medium and Large sizes. Each has a smaller, more compact footprint than previous models. Use of premium materials like anodized aluminium and glass fibre composite resin lets us make a pen tablet that feels reassuringly strong but is a mere 8mm thick. Artists and Designers have their own unique workflows. Some artists work only digitally, while others prefer to start their creative workflow on paper first. The new Intuos Pro line can do both. If your workflow is completely digital, choose the standard version of the Intuos Pro. If you prefer sketching on paper and then completing your art on your computer, then the revolutionary new Intuos Pro Paper Edition fits the way that you work. Drawing with our new Wacom Pro Pen 2 feels so natural that it’s hard to tell where your hand ends and the pen begins. With precise pressure sensitivity, virtually no lag and natural tilt support, it’ll soon become your favourite creative tool. Choose from Wacom Intuos Pro and Wacom Intuos Pro Paper Edition – both available in Medium (338 x 219 x 8 mm) and Large (430 x 287 x 8 mm) sizes. Capture editable versions of your ink sketches on paper with the Finetip Pen (or optional Ballpoint Pen) on the Intuos Pro Paper Edition and finish your art on your computer. Or work digitally from start to finish with the standard version. layered raster and vector formats. The Touch Ring, Radial Menus, pen side switches and customizable ExpressKeys™ provide quick and easy shortcuts, while multi-touch gestures let you zoom, pan and navigate with a flick of your fingers. Connect to your Mac or Windows PC with USB or built-in Bluetooth.